EPA Takes Action On Toxic Ariz. Copper Plant : The Two-Way The unpublicized "finding of violation" issued against the Asarco copper smelter in Hayden, Ariz., claims the company has been emitting illegal amounts of lead, arsenic and eight other dangerous compounds for six years. Asarco disputes that. 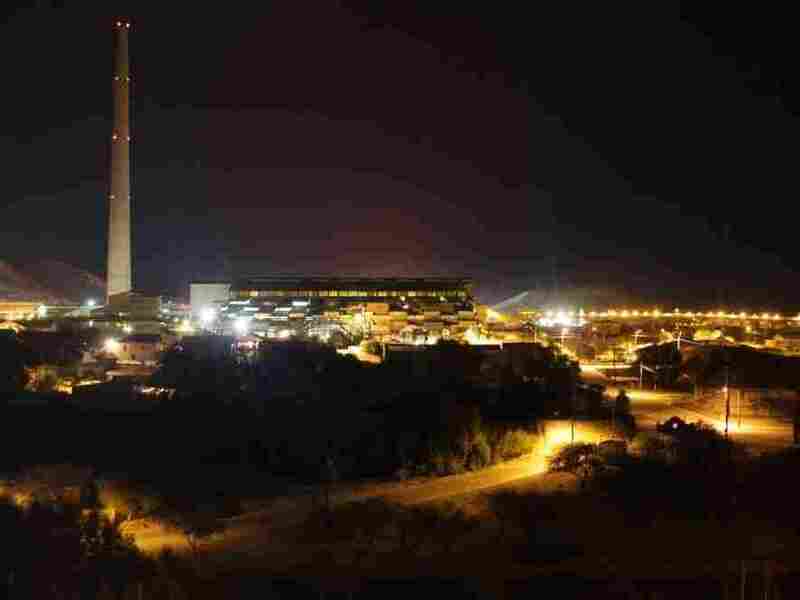 A haze can be seen at night hovering over the Asarco copper smelter, which turns copper ore into nearly pure copper bars. The Environmental Protection Agency has taken tough enforcement action against a copper smelter in Arizona that has drawn complaints about toxic pollution for years. The unpublicized "finding of violation" issued against the Asarco copper smelter in Hayden, Ariz., claims the company has been continuously emitting illegal amounts of lead, arsenic and eight other dangerous compounds for six years. The finding also suggests that the state of Arizona, which has primary responsibility for federal Clean Air Act enforcement in the state, has failed to take meaningful action. The EPA revealed the existence of the Nov. 10 finding to NPR and The Center for Public Integrity (CPI) as they were concluding a joint, six-month-long investigation of air pollution and regulation in Hayden as part of the Poisoned Places series. CPI has an extensive report on the results of that investigation here, including a video about the community's struggles. In a statement to NPR and CPI, Asarco says the EPA's finding is "unexpected" and promises a vigorous challenge. "Our smelter is in compliance with its air permit," writes Tom Aldrich, an Asarco spokesman. "Asarco works closely with its regulators and proactively seeks innovations as science evolves and environmental laws and rules are updated." Henry Darwin, director of the Arizona Department of Environmental Quality, also says that Asarco does not exceed federal emissions standards. "I think it's a clear attempt by EPA to make it seem as if the state has done nothing," Darwin says. His agency is responsible for issuing federal air pollution permits in the state. "We have no reason to believe that [Asarco] has crossed that [pollution] threshold." He dismisses the EPA's action as a "paperwork violation." But the EPA also notified Arizona Gov. Jan Brewer (R) last week that Asarco has emitted excessive amounts of lead this year. In a letter provided to NPR and CPI, the EPA says its monitors detected lead at two to three times federal limits on some days during 2011. The EPA also says its team of environmental forensics investigators spent six months testing and analyzing emissions at Asarco. "There is no simple paperwork violation," says Jared Blumenfeld, EPA's administrator for the region that includes Arizona. "This is a question of whether a large facility that smelts copper has the controls necessary to deal with lead emissions." Hayden is a poor, largely Hispanic community of 900 people with a long history of copper smelting and complaints about toxic emissions. 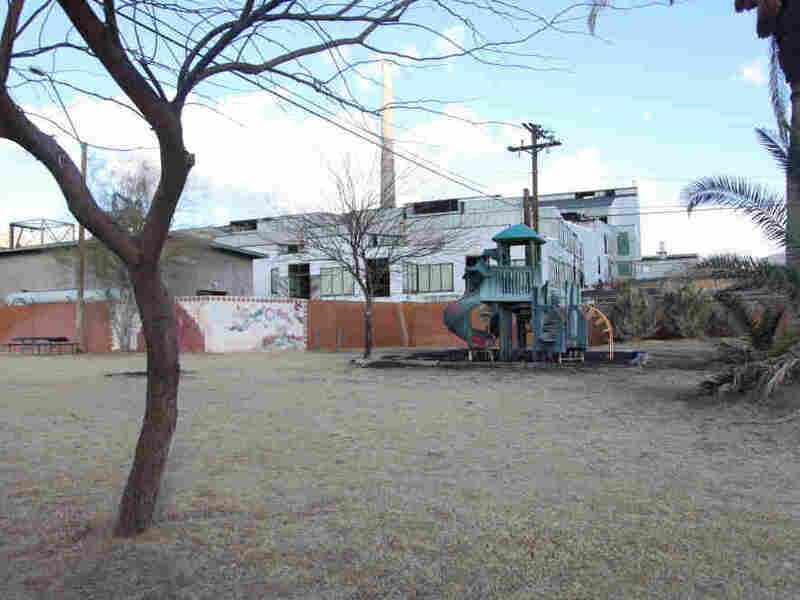 "I remember clouds of blue smoke coming down into the playgrounds in the community and coughing and your eyes burning," recalls Manny Armenta, 56, who represents union workers at Asarco. Betty Amparano has two children who have tested positive for excessive levels of lead. She filed a lawsuit more than a decade ago and 200 neighbors eventually joined in. Asarco settled in 2005 during a bankruptcy and paid out about $10,000 per family. Three years ago, the EPA ordered Asarco to remove and replace the soil from more than 200 yards in Hayden after finding soil contaminated with lead and arsenic. "Why the hell did you take so long?" Amparano asks of the EPA's most recent action. "I'm tired of dealing with death after death after death." Asarco insists its emissions are not responsible for health problems in Hayden. The EPA says it hopes the company will voluntarily install expensive new pollution controls. The company faces millions of dollars in fines, which are typically reduced if the company agrees to comply. Legal action is also possible if Asarco does not take steps to limit its toxic emissions. A separate process is underway that directly targets Asarco's lead emissions. It could take five years or more to force cutbacks in lead. "It's not like it's a water faucet that gets shut off and that's it," says Jill Corona, Amparano's daughter and a photographer now living in Tempe, Ariz. She worries about the rest of the family still living in Hayden. "I just want someone to tell me that Hayden is a safe place to live and I don't want to wait more than five years." Jim Morris of the Center for Public Integrity contributed to this report. Additional reporting from this series — including an interactive map that lets you explore facilities that are emitting toxic chemicals in your town — is available on NPR's Poisoned Places page. The Asarco copper smelter in Arizona looms behind a playground at the Hayden City Park.